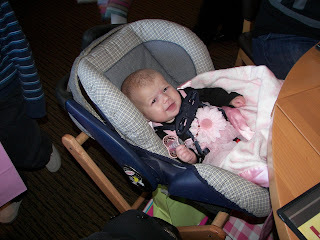 Ella was dedicated last Sunday at church. It went well she looked so cute in her dress from Aunt Kandace and Uncle Andrew. It was the perfect dress for the occasion. We celebrated after at the California Pizza Kitchen. It was a great day. Ella's Auntie Michaelin and her new Uncle Remy were in town for the weekend. We enjoyed spending time with them ,later that day we went to Yates cider mill. We are looking forward for Ella's Auntie Jenn and her cousin Jordan to visit in a couple of weeks. They have not met Ella yet it should be fun.